A ruined broch, standing in a superb position on a low terrace above the Strathmore river (Sutherland). A distinguishing feature is the massive triangular lintel over the debris-blocked entrance. The interior is also full of rubble. 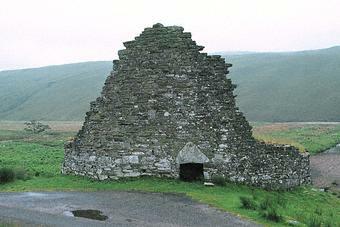 This ruined broch stands generally 1.8m to 3.3m high but rises to 6.7m on the north-east. Only the outer face of the wall survives: the inner one has collapsed and now a modern buttress supports the surviving wall. Within the wall's thickness a stone stairway gave access to several narrow galleries.